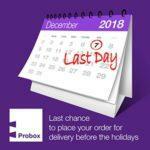 » Pre-Christmas Delivery – Order Now! We are approaching the the Christmas holidays. For delivery before Christmas please be sure to place your order by the end of w/c 3rd Dec. Limited slots available. Get ahead of the game for January by booking in your drawers in after the 7th of Dec for delivery early in the New Year.